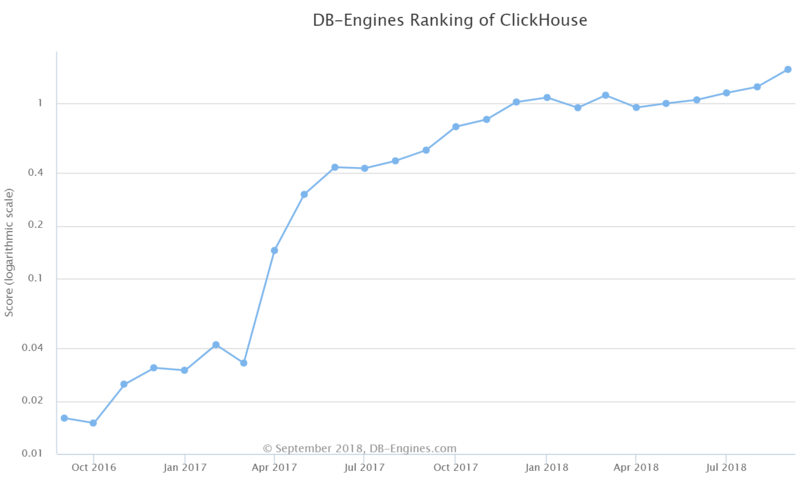 And indeed, in my conversation with customers and partners, the narrative has changed from: “ClickHouse, what is it?” to “We are using or considering ClickHouse for our analytics needs”. 2. ClickHouse changed their versioning schema. Unfortunately it changed from the unconventional …; 1.1.54390; 1.1.54394 naming structure to the still unconventional 18.6.0; 18.10.3; 18.12.13 naming structure, where “18.” is a year of the release. Now to the more interesting technical improvements. 3. Support of the more traditional JOIN syntax. Now if you join two tables you can use SELECT ... FROM tab1 ANY LEFT JOIN tab2 ON tab1_col=tab2_col . 4. Support for DELETE and UPDATE operations. This has probably been the most requested feature since the first ClickHouse release. ClickHouse uses an LSM-tree like structure—MergeTree—and it is not friendly to single row operations. To highlight this specific limitation, ClickHouse uses ALTER TABLE UPDATE / ALTER TABLE DELETE syntax to highlight this will be executed as a bulk operation, so please consider it as such. Updating or deleting rows in ClickHouse should be an exceptional operation, rather than a part of your day-to-day workload. 5. ClickHouse added a feature which I call Dictionary Compression, but ClickHouse uses the name “LowCardinality”. It is still experimental, but I hope soon it will be production ready. Basically it allows internally to replace long strings with a short list of enumerated values. How does this help? Firstly, it offers space savings. The table will take less space in storage, as it will use integer values instead of strings. And secondly, performance. The filtering operation will be executed faster. This is 0.859 sec vs 0.350 sec (for the LowCardinality case). Unfortunately this feature is not optimized for all use cases, and actually in aggregation it performs slower. 6. And the last feature I want to mention is the better support of Tableau Software: this required ODBC drivers. It may not seem significant, but Tableau is the number one software for data analysts, and by supporting this, ClickHouse will reach a much wider audience. Summing up: ClickHouse definitely became much more user friendly since a year ago! Wow, it is moving up the db-engines list fast. Soon it will pass RocksDB. RocksDB also uses LSM-tree. Why is it more update-friendly than Clickhouse? In short – RocksDB was designed as a key-value engine, while ClickHouse was designed for the bulk operations. With this RocksDB performance will be affected if there are multiple updates of a row that are not merged – RockDB will need to find the latest version of the row. By the same reason point selects in RocksDB is not as fast as in InnoDB. Vadim, thank you for the update, I am a newcomer and an early adopter of Clickhouse. I have had a great experience so far using it locally on a single cluster/machine. Speaking about updates and deletes, in my opinion there should never be the case to implement them in the classic old-fashioned way of RDBMS. Both operations must be implemented with inserts, i.e. a flag to mark delete event, a version to mark updates. It’s just a matter to make it more user friendly for the developers and without compromising on speed.